Jeroboam II (ירבעם השני) was the the fourteenth king of the ancient Kingdom of Israel, over which he ruled for 41 years (2 Kings 14:23). Under his leadership, Israel reached its greatest geographical extent and the height of its economic and military power. He even reportedly captured the mighty city of Damascus (2 Kings 14:28). However, his reign was criticized by the prophets for its spiritual and moral corruption. William F. Albright has dated his reign to 786 B.C.E.-746 B.C.E., while E. R. Thiele offers the dates 782 B.C.E.-753 B.C.E. The son and successor of Jehoash, Jeroboam's long reign, which may have begun while his father was still alive but suffering from leprosy, was contemporary with those of Amaziah (2 Kings 14:23) and Uzziah (15:1), kings of Judah. He was victorious over the Syrians (13:4; 14:26, 27), and reportedly expanded Israel to the limits indicated during the reign of Solomon, extending north into Lebanon, east into the transjordan and south to the Dead Sea. Jeroboam II's name occurs in the Old Testament only in 2 Kings 13:13; 14:16, 23-29; 15:1, 8; 1 Chronicles 5:17; Hosea 1:1; and Amos 1:1; 7:9, 10, 11. In all other passages it is Jeroboam I, the son of Nebat that is indicated. While his reign was the most prosperous that Israel had yet known, the prophets Hosea and Amos declared that sin widely prevailed in the land. He is also denounced by the authors of 2 Kings (2 Kings 14:24) for repeating the sin of the first Jeroboam by supporting the shrines at Dan and Bethel. However, the same text also preserves an opinion of the prophet Jonah which portrays Jeroboam II as the savior sent by God to deliver Israel from oppression (2 Kings 14:27). Tel Megiddo, site of the discovery of the seal belonging to "Shema, Servant of Jeroboam"
A number of archaeological finds confirm Jeroboam's historicity and the apparent prosperity of his kingdom. In 1904, during an early excavation of Megiddo, a bronze seal was discovered belonging to a royal minister of Jeroboam. It was skillfully engraved with a figure of a roaring lion. Its inscription read, "Shema, Servant of Jeroboam." In 1910, G. A. Reisner found 63 inscribed potsherds while excavating the royal palace at Samaria, which were later dated to the reign of Jeroboam II. These ostraca contain valuable information about the script, language, economy, and administrative system of the period. They indicate a well organized administration and substantial trade network. Egyptian artifacts found at the site indicate trade with the court of the pharaohs. More recent archaeological finds at Samaria and elsewhere confirm the picture of Jeroboam's reign as one of domestic peace and prosperity, and also confirm that the prophetic warnings against idolatry did not prevent the Israelite populace from possessing numerous statuettes of a goddess, possibly Astarte, who was worshiped together with Yahweh and possibly other deities. A man of great energy, Jeroboam succeeded in developing the northern Kingdom of Israel to its greatest extent. The Syrian kingdom of Damascus, since the very first days of the independent northern kingdom established by Jeroboam's namesake, Jeroboam I, had been a thorn in the flesh of the northern kings. Damascus had been weakened when it was attacked by Assur-dan III, King of Assyria (773). This enabled Jeroboam to extend the boundaries of his kingdom, in accordance with claims never totally relinquished. A note in 2 Kings 14:28 indicates that Jeroboam conquered Damascus itself, as well as the Syrian city of Hamath. However, some scholars believe he may have had to pay tribute to the rising power of Assyria for its acquiescence in his military expeditions and conquests, among which were included the Gileadite cities of Lo Debar in Gilead and Ashteroth Karnaim east of the Jordan. You who rejoice in the conquest of Lo Debar and say, "Did we not take Karnaim by our own strength?" But the Lord God Almighty declares, "I will stir up a nation against you, O house of Israel, that will oppress you all the way from Lebo Hamath to the valley of the Arabah" (Amos 6:13-14). According to Amos 7:10-11, Amaziah, the priest of Bethel, sent a message to Jeroboam, saying: "Amos is raising a conspiracy against you in the very heart of Israel. The land cannot bear all his words. For this is what Amos is saying: 'Jeroboam will die by the sword, and Israel will surely go into exile, away from their native land.'" However, Amaziah had not accurately represented Amos' prophecy, which was as follows: "The high places of Isaac will be destroyed and the sanctuaries of Israel will be ruined; with my sword I will rise against the house of Jeroboam." (Amos 7:9). Although Jeroboam himself died of natural causes, the prediction concerning Israel's long term fate proved true in 722 when the northern kingdom was destroyed by the Assyrians. 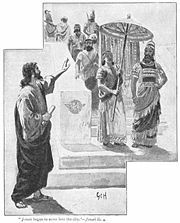 Another of Jeroboam's opponents was the prophet Hosea, who likewise criticized the shrines at Bethel and Dan. Unlike Amos, however, Hosea specifically opposed the golden calf statues so detested by the priests of the Temple of Jerusalem, but which were probably seen in the north as no more offensive than the golden cherubim of Jerusalem: "Throw out your calf-idol, O Samaria!" Hosea declared. "This calf—a craftsman has made it; it is not God. It will be broken in pieces, that calf of Samaria" (Hosea 8:5-6). In terms of his positive accomplishments, Jeroboam is remembered as having saved Israel from oppression and having won back for it the territories it had formerly lost. In 1 Chronicles 5:17, he is credited with having classified by genealogies the inhabitants of the recovered territory east of the Jordan River. Jonah at Nineveh. Jonah reportedly saw Jeroboam as Israel's "savior." He was the one who restored the boundaries of Israel from Lebo Hamath to the Sea of the Arabah, in accordance with the word of the Lord, the God of Israel, spoken through his servant Jonah son of Amittai, the prophet from Gath Hepher. The Lord had seen how bitterly everyone in Israel, whether slave or free, was suffering; there was no one to help them. And since the Lord had not said he would blot out the name of Israel from under heaven, he saved them by the hand of Jeroboam son of Jehoash (2 Kings 14:25-27). Contrary to the usual method of the Books of Kings, in which prophetic experiences and predictions are elaborately introduced, the actual words of Jonah ben Amittai are not given. The boundaries mentioned correspond with the ideal limits given in Amos 5:14. These passages also give some insight into the attitude of Jonah himself, who was commanded to preach repentance at the Gentile city of Nineveh. Jonah would have preferred that the city be overthrown, probably by Jeroboam, but through his prophecy it repented and was spared by Yahweh, much to Jonah's dismay (Jonah 4). Jonah seems to have recognized Jeroboam as the "savior" and "helper" (moshia) of Israel, two titles with messianic implications. Some critics see the denunciation of the corruption of Jeroboam's regime by Amos and Hosea as the expression of profound disappointment that his military and economic successes were not accompanied by religious reforms in which the worship of foreign deities would be forbidden and corruption among the priests of Yahweh would be corrected as well. It may also be, however, that Jonah represented a pro-Jeroboam faction among the prophets, while Amos led a faction that wished to see his demise. A similar dynamic is clearly present among prophetic factions in the case of King Ahab (see 1 Kings 2:22) and others. Amos' prediction that Jeroboam would die by the sword, however, proved false, as 2 Kings 14:29 reports that, "Jeroboam rested with his fathers, the kings of Israel" after his long and prosperous reign. Regarding the shrines at Dan and Bethel, even Amos, however, does not go as far as the Books of Kings, which demands that these alternative Israelite religious centers to that of Jerusalem be destroyed. He was primarily concerned that these altars be sincerely devoted to true religion, in which ethics play just as an essential part as ceremony. Hosea, on the the other hand, directly attacks the golden calf statues, as well as other corruption. An often overlooked passage in the Book of Hosea shows that the prophet's opinion that the demise of the kingdom of Israel would result from a previous action by Jehu of Israel, the "massacre at Jezreel," in which Jehu slew Jezebel and scores of the descendants of King Ahab. The passage is notable in that the massacre was commanded by none other than the prophet Elisha in the name of Yahweh (2 Kings 9:7). As for the other events of Jeroboam's reign, all he did, and his military achievements, including how he recovered for Israel both Damascus and Hamath… are they not written in the book of the annals of the kings of Israel? Jeroboam rested with his fathers, the kings of Israel. And Zechariah his son succeeded him as king. It is a pity that the Annals of the Kings of Israel, referred to several times in the Books of Kings, is lost to today's readers, for Jeroboam was clearly one of Israel's greatest kings. He was succeeded by his son Zechariah, who was assassinated within six months and replaced by his killer, Shallum. Zechariah was avenged within the month by Menahem, who overthrew and killed Shallum. The specter of the Assyrian Empire now loomed large, however. After several more, usually short-lived, kings attempted various strategies to either placate or resist, within a generation the Kingdom of Israel had fallen to the Assyrians, who exiled many of its citizens and colonized it with foreign peoples. 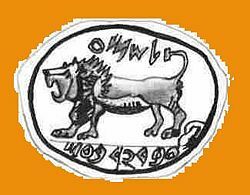 Jeroboam II was Israel's last great king. Bolen, Todd. The Reign of Jeroboam II: A Historical and Archaeological Interpretation. Thesis (Th. M.)—Master's Seminary, 2002. Albright: 786 B.C.E. – 746 B.C.E. Thiele: 782 B.C.E. – 753 B.C.E. This page was last modified on 3 July 2013, at 20:31.